There we have it, Deathwing has been vanquished in his most heroic incarnation. His madness is at an end and Azeroth is once more safe from imminent destruction. Big congratulations and thanks are due to everyone <Abraxas> of Dath’Remar who’s been part of our Dragon Soul journey. There have been tough and frustrating times, but we’ve managed to pull through and it was worth it in the end. Keep an eye out for my Heroic Madness healing and strategy guide and a retrospective look at Cataclysm and Dragon Soul, and once Blizzard pulls their finger our and gives me my Beta invite I’m sure I’ll have plenty to say about that as well. 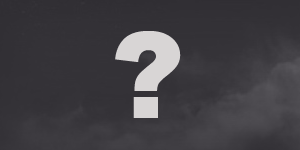 Finally, if you’re in the market for a guild that raids in the New Zealand time zone (GMT+12) and want to help make us an even stronger force in Mists, you’d be mad not to visit http://abraxasguild.wowstead.com/ and see if you like what you read. We’re on the lookout for people of any class or role to help us farm heroic Dragon Soul, clear up old heroic achievements and help us hit the ground running in Mists. 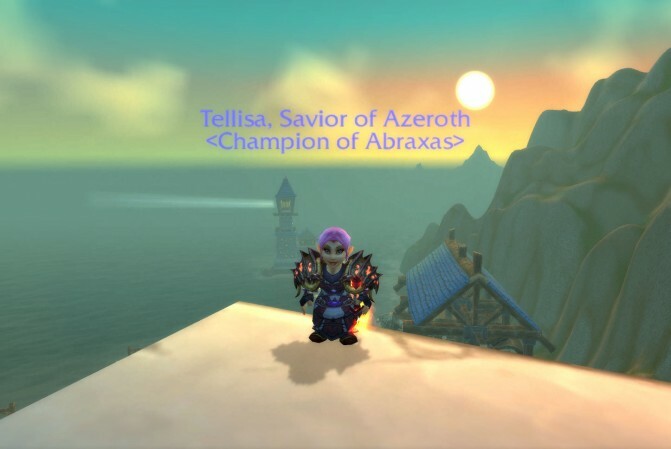 Most annoying things: 1) Warlock shoulders, 2) There's a "u" in Saviour, damn it! Well, as far as I know I’ve not been tagged yet, but since most of my blogroll has already joined in I’m going to do it anyway. Sticking it to the system, yeah! Unfortunately I only actually have five sub-folders in my WoW image directory, which is something of a problem given the meme. So instead I’ll give you the sixth image from each of my sub-folders. Once again, screwing the system. Such a rebel! I took this image early in the beta, simply because the new water texture was absolutely breathtaking compared to what was available in the live game at the time. It was jawdropping. 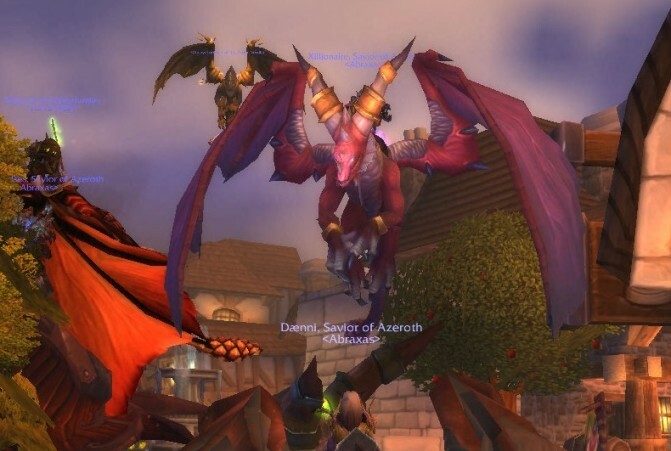 Plus, I wanted to show off my new mount, even if it was only the 10-man version, we were really proud to get them. 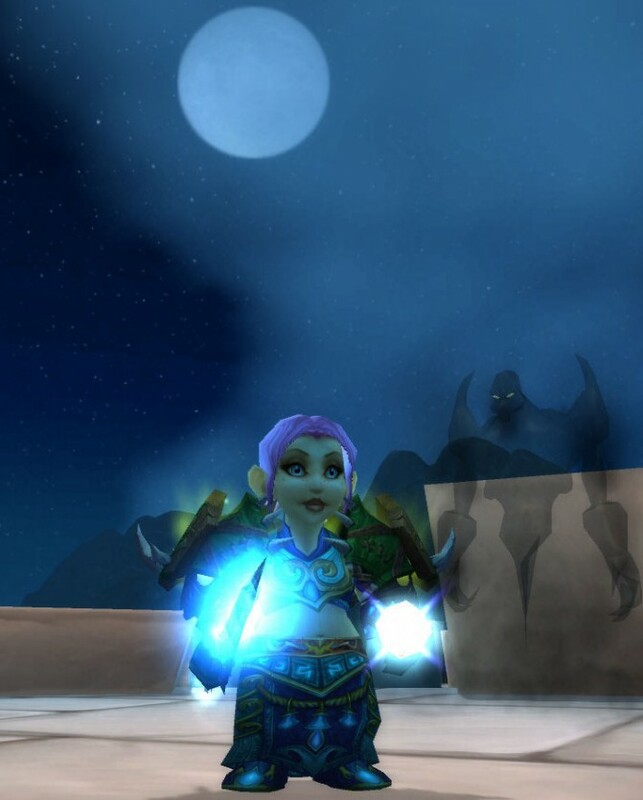 Back in 2007 myself and my favourite tank were in the Royal Guardians guild on Perenolde-US. 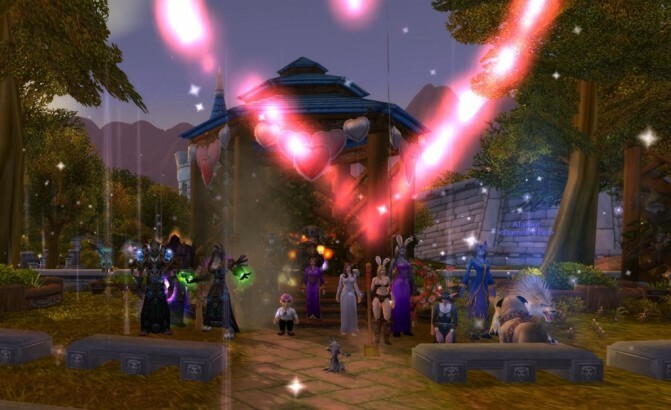 One day, for reasons which are lost to the mists of time, we decided to roll level 1 Night Elves, slip on a guild tabard, and entertain the denizens of Darnassus. As I recall, there were games involved too, in particular a sort of tag game with Heavy Leather Balls. This brings back some memories. If you don’t get it, let me explain. 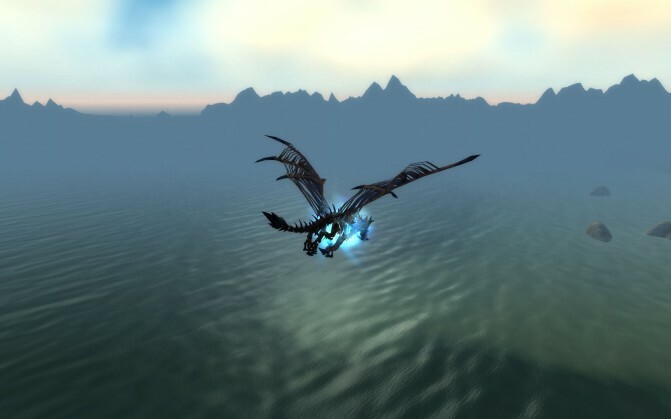 On the Lich King encounter, there were these Val’kyr who would grab three of your party and fly with them to the edge of the platform and then drop them off. It helped to kill them if you kept them going all the same way so you could AoE stun them and cleave them. The direction they flew was a straight line from the middle of the room to the edge, so where you stood when you were picked up determined precisely where they went. This diagram shows why, for a given tightness of group (the white circles), it was better to have that stack point further out than right in the middle. 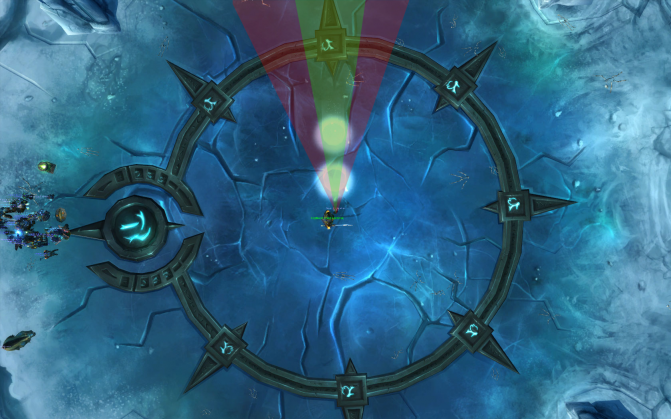 If you stand in the more central stack point but off to the sides of the white circle, the val’kyr’s path could be the edge of the red zone. Whereas if you stand on the edges of the white circle that’s further out, the range of paths is much narrower. My contention was that narrowing the possible routes and getting more reliable cleaving and stunning would outweigh the disadvantage of the val’kyrs starting a little closer to the edge of the platform. Not visible in this screenshot: AVR scrawls all over the place, showing in no uncertain terms exactly where to run when Defile hit. This is Malevica, apparently in Shadowfang Keep for the Love Is In The Air holiday, being stalked by my favourite tank, this time in Druid form. I’d levitated her, and apparently she’d decided to get revenge while my back was turned. Sneaky! Oh, saving the best for last! I can’t claim credit for this post or the detective work that went into it, but it’s a masterpiece indeed. 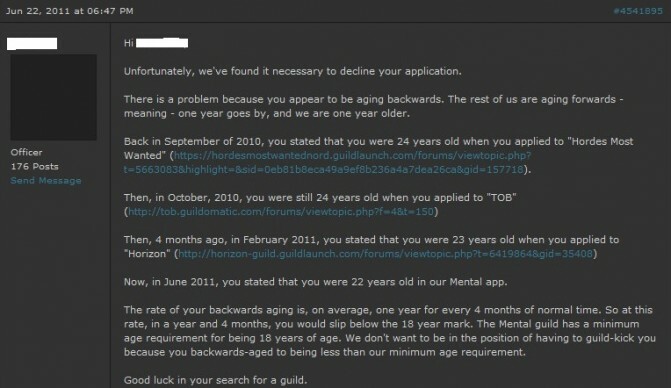 The assumption we made was that the applicant had not in fact discovered the secret to eternal youth, but was just a teenager lying about his or her age to get past a 18+ rule that’s as much there for new members as it is for existing ones. Kids, if you’re going to do this, at least make it convincing and just add 5 years to your actual age. That way you’ll be consistent even when you tick over a year, and 5 is a nice round number that’s easy to remember. Here’s the challenge, finding people in my Google Reader who don’t appear to have joined in yet. So I hereby tag the few people below, and anyone else who reads this can consider themselves tagged as well. With a Heavy Leather Ball. As if that wasn’t enough, when we got back home we found ourselves invited to an in-game party organised by the guild, complete with excessive quantities of alcohol, drinking games to go with it, and of course awesome wedding presents! We’re now the proud owners of his and hers Mekgineer’s Choppers, amongst other things. Seriously, <Abraxas> is such a great bunch of people. Thanks a lot to all of you for giving us such a fun night!